Speccy Portable is a lightweight and portable tool you can use to view numerous details about your computer’s software and hardware. You can directly run the app by double clicking on its executable and it will automatically detect all the hardware components on your PC. As a result, you can see information at a glance in a summary section, although there are also dedicated areas for the operating system, RAM, processor, hard drives, graphics card, optical drives, network, peripherals and audio. 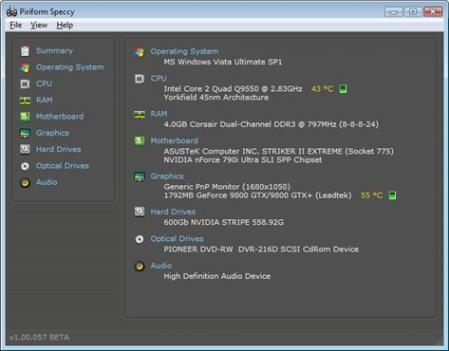 Speccy Portable offers details regarding Windows automatic updates, User Account Control, antivirus, system folder, services, scheduler, power profile, device tree, firewall notification level and more. It also displays a wealth of information about your processor’s cores, technology, threads, hyperthreading, fan speed, average temperature and so on. Of course, these are just a small part of the hardware and software related data you can view using Speccy Portable, plus you can export all the information to a plain text or XML document.